Public campaigns and other policy instruments can significantly influence consumer behaviour and contribute to a reduction of consumer food waste. However, there exist very few studies evaluating the extent to which policy interventions actually reduced or prevented food waste. 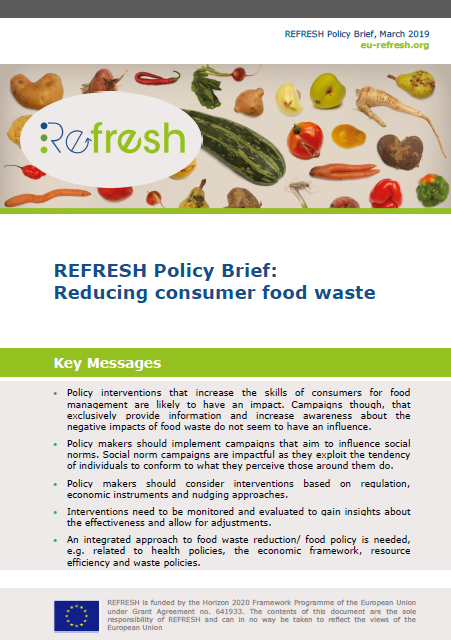 In this REFRESH Policy Brief, Ecologic Institute’s Stephanie Wunder summarises REFRESH findings on consumer behaviour as well as related research results, and derives policy recommendations to reduce consumer food waste. With an estimated contribution of 53%, the consumer is the primary contributor to food waste across the food chain in higher income countries. Considering that a large amount of this waste could be avoided, the urgent need to change consumer behaviour is evident. Reducing consumer food waste and policy interventions to support this effort is therefore a key area of the EU project REFRESH. Based on desktop research and a REFRESH survey in four countries with 3354 households and their food waste behaviour, the policy brief translates the findings on consumer behaviour into policy recommendations. Policy interventions that increase the skills of consumers for food management are likely to have an impact. Campaigns though, that exclusively provide information and increase awareness about the negative impacts of food waste do not seem to have an influence. Policy makers should implement campaigns that aim to influence social norms. Social norm campaigns are impactful as they exploit the tendency of individuals to conform to what they perceive those around them do. Policy makers should consider interventions based on regulation, economic instruments and nudging approaches. Interventions need to be monitored and evaluated to gain insights about the effectiveness and allow for adjustments. Wunder, Stephanie 2019: REFRESH Policy Brief: Reducing consumer food waste. EU Horizon 2020 REFRESH.